"Sheer joys of life", is the best way to describe the Rheingau, this sunny landscape with an extension of 38 kmts. of length between the cities of Wiesbaden and Lorchhausen. It refers to the joy of life that the inhabitants of this small and lovely region radiate. The Rheingau is also called the "German Riviera", due to its mild climate throughout the year and its proximity to the Rhine river. The people who live here are called Rheingauer; they live from and for the wine, which has formed and marked their way of life for many centuries. The wine-growing tradition goes back to the Roman time. It is said that the emperor Charles the Great was the first one to plant vines here. The unique weather conditions, the steep hills protected by the Taunus mountain chain and located on the Rhine river, the slate and sandloose soils give the ideal carachteristics to noble Riesling vines and racy red wines. The full-bodied ,strong wines that grow on the banks of the sunreflected Rhine river, are well known around the world. 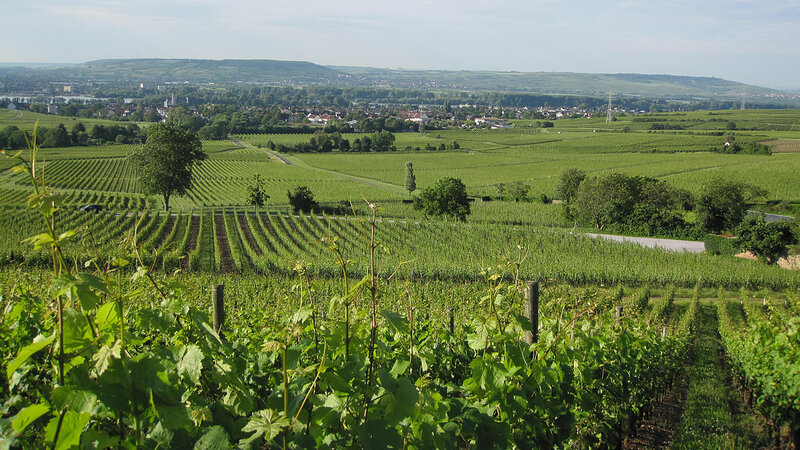 The wine culture has influenced the Rheingau throughout the centuries until today. Competent monks constructed here stately cloisters and monasteries and run the wine growing as well as the lucrative wine handling, carried through the Rhine river on ships from their own. The monastery of Eberbach is one of the most famous and best preserved cloisters, as well as its renowned vineyards under the name of "Steinberg", from where the Cistercian monks run a prosperous business, back in the middleages. They set the pilar that made the Rheingau a worldwide famous wine- growing area. The ideal weather conditions are to be found here specially for the Riesling vine. That is why 84 percent of the 3000 hectare-vineyard area is cultivated with Riesling; in another 11 percent of this area, the vine pinot noir is cultivated, which grows specially in the sunny and steep hills of Ruedesheim and Assmannshausen. Besides the wine culture the Rheingau also offers numerous other sights. Ancient castles, fortresses, noble and aristocratic villas from all epoques up to the medieval times can be found in each of the five Rheingau cities of Eltville, Oestrich-Winkel, Geisenheim, Ruedesheim and Lorch as well as in the communities of Walluf and Kiedrich. They are lovely restored and maintained, and in many of them take place different activities throughout the year, such as festivities, concerts and events all related to the wine and social culture.